If you’ve been to the store recently, chances are you’ve spotted the school supply section. Can you believe it’s already that time of the year? Luckily Jasper still has a few more years until we have to deal with that. We live in a University town though, so the area will soon be flooded with returning students and some starting fresh! My cousin Clare will be starting her freshman year here and I’m THRILLED to have some family nearby. That also means…DORM LIFE! Did you live in the dorms at some point in your college career? Clare is moving halfway across the country for college so I wanted to make sure she felt at home! 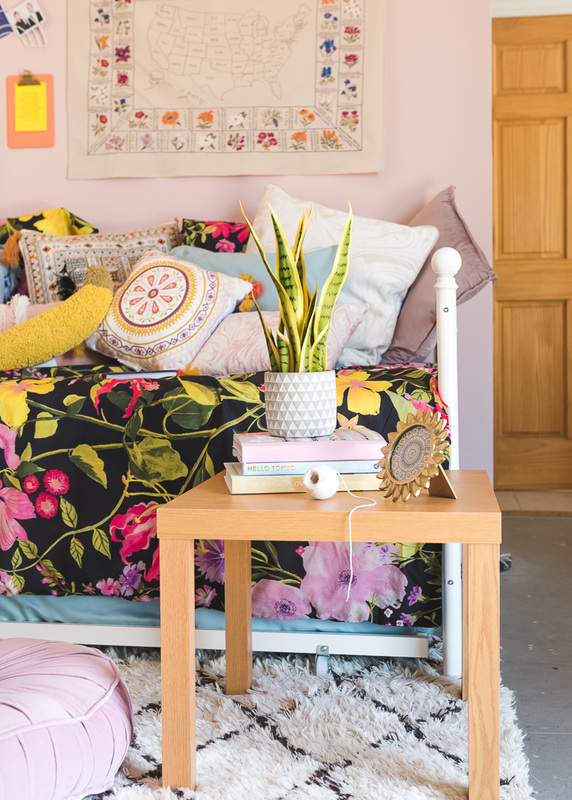 With the help of DHP Furniture we created the ultimate dorm room set-up and I’m sharing all our great finds with you! If you have any advice, tips, tricks, words of wisdom to pass along to an incoming freshman, I’d love to hear it! What better place to start than with the bed! 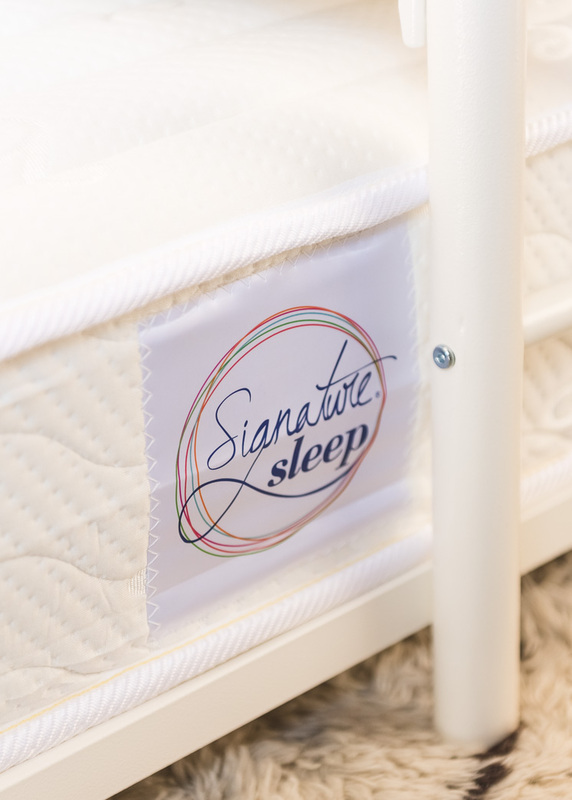 Sleep is crucial for a college student (whether they know it or not) so we wanted to make sure Clare had a great mattress. 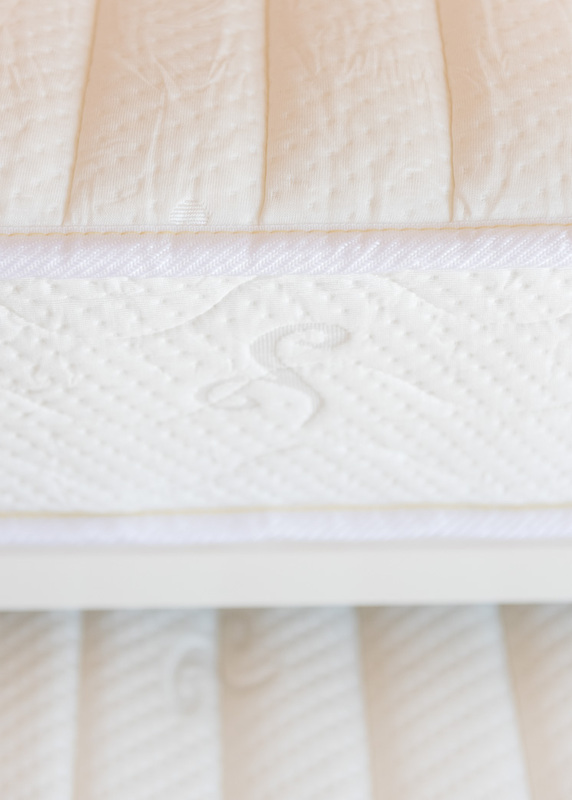 The new Signature Sleep line at DHP is incredible. They use both coils and foam for ultimate comfort. 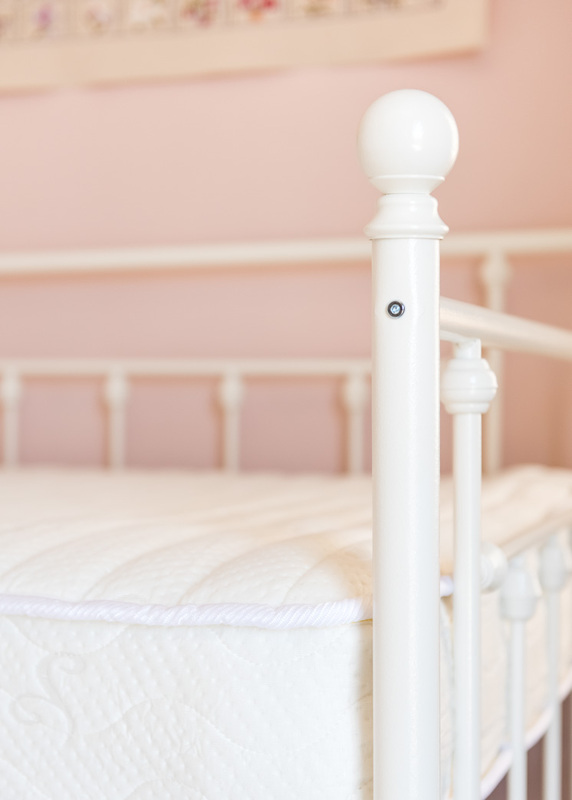 It’s covered with a soft breathable knit fabric and the whole thing is reversible so you can rotate and flip the mattress every so often to prolong the life. So many benefits! Not to mention their uber comfy pillows. A trundle bed is a great idea for a dorm room because of the tight space constraints. This way, Clare can have friends come and visit anytime and give them a place to sleep! The Manila Metal Daybed has Victorian rounded finials for a classic and clean look. The trundle is on wheels, with two locking for stability, for easy setup! 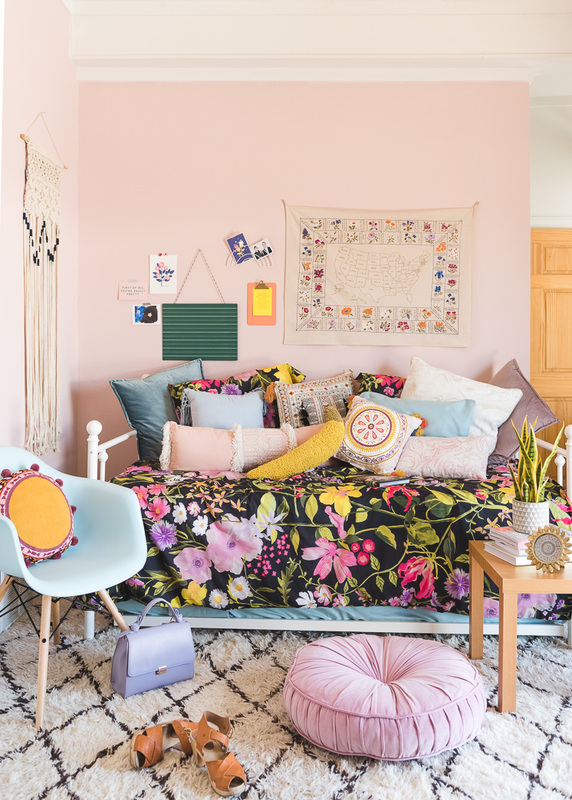 We wanted the style of the room to be a mix of feminine florals and bohemian accents. We brought is lots of textures from the rug, to the wall hangings, to countless pillows! 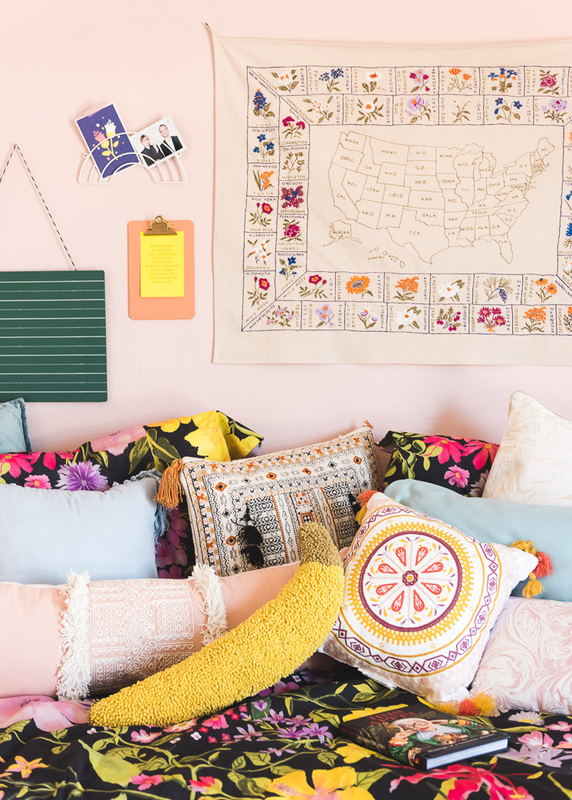 Can you ever have too many pillows? The correct answer is never. You need that Banana Pillow in your life! The blue midcentury modern chair is a stylish alternative to a desk chair and adds a nice pop of color. It’s also lightweight and wipes clean easily, so makes for a smart choice for a dorm. We love the old school green chalkboard to write little reminders on. And the wire rainbow is so sweet to display photos of friends and family you’re missing! Clare will be more than ready with this set-up! Between the late night study sessions and endless social engagements, we hope she can squeeze some sleep in there somewhere! This post was sponsored by DHP. Thanks for supporting the brands that allow us to create stellar original content! 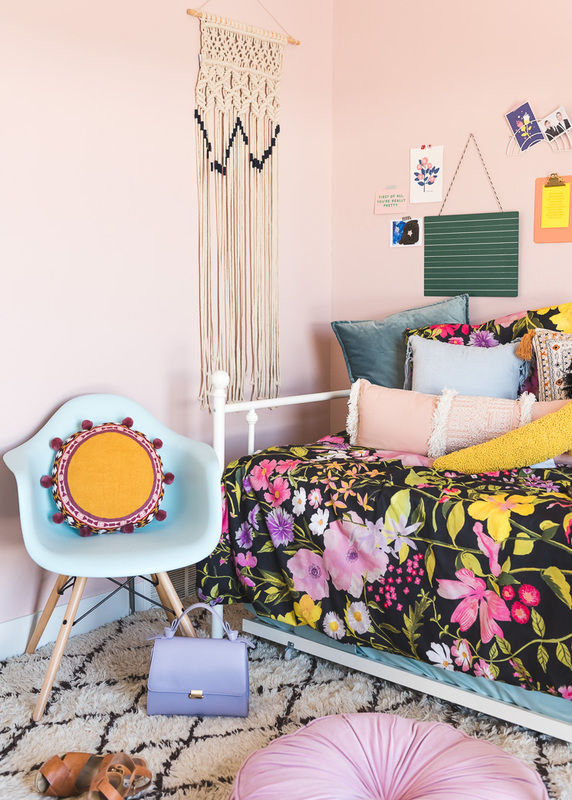 This room makeover is perfect. 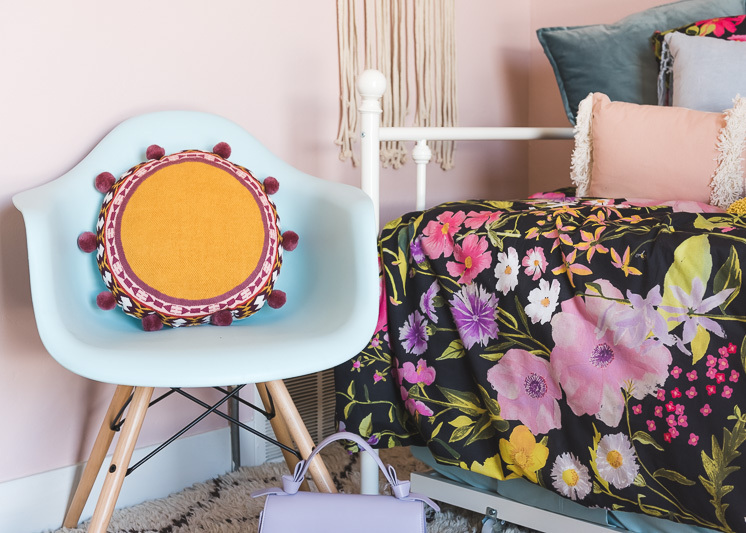 I love all the colors and especially the flower print on the blanket. I may not live in a dorm room, but I would totally live in this space! 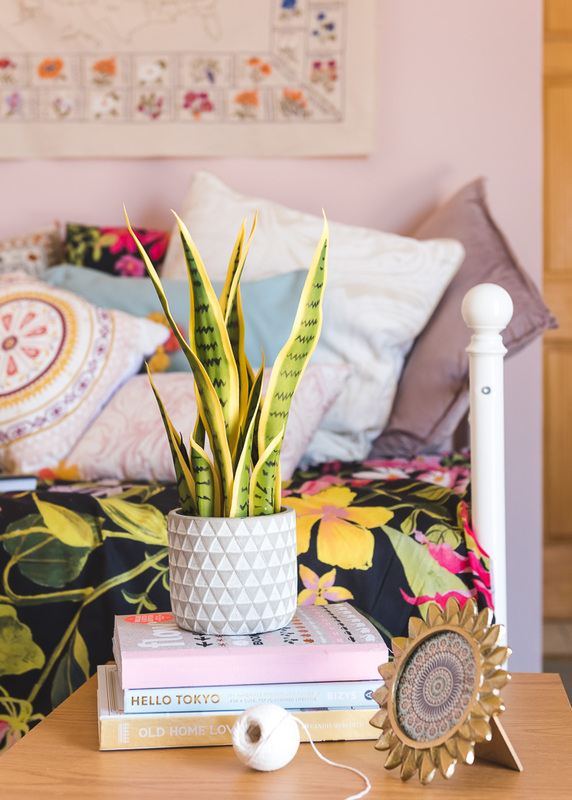 I’m obsessed with all the colors and textures, that’s probably the best looking snake plant I’ve ever seen and WHEREEEE is that map/flower tapestry from??! I have to have it! The snake plant is actually fake from Target! No green thumb necessary! 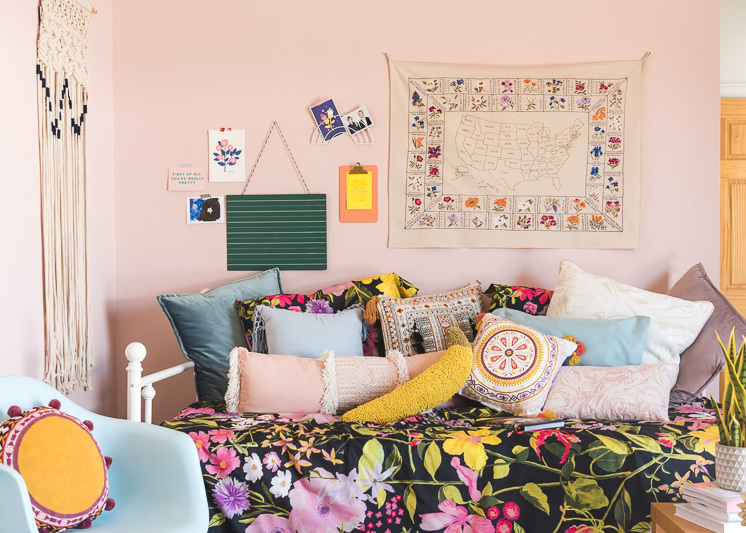 And the flower map is from Urban Outfitters but we think it’s sold out because we couldn’t find the link to it shortly after we purchased it!